NETWORK FINALS: The season premiere of CELEBRITY FAMILY FEUD gained 0.1 in final numbers, while the season premiere of TO TELL THE TRUTH lost the same. CABLE HIGHLIGHTS: The midseason finale of AMC’s FEAR THE WALKING DEAD led Sunday cable at 0.73, up 0.13 from last week, but down from the 2017 0.93/0.83 2-hour midseason finale (in July), with INTO THE BADLANDS up 0.06 to 0.32, and TALKING DEAD up 0.07 to 0.20. On HBO, WESTWORLD had its second consecutive rise, up 0.09 to 0.59, while the somehow already-renewed SUCCESSION ticked down to 0.14 (although that’s better than the 0.09 Week 2 for HERE AND NOW), and LAST WEEK TONIGHT slipped 0.02 to 0.38. The season premiere of TNT’s CLAWS was at 0.51, up 0.07 from last year’s series premiere albeit down 0.05 from the 2017 finale (and helped by the 0.55 lead-in from the network premiere of the final HUNGER GAMES movie). On Adult Swim, ROBOT CHICKEN ticked down to 0.47, and JOE PERA TALKS TO YOU was at 0.23/0.20 compared to last week’s 0.31/0.26. On TBS, JOKERS WILD rose 0.05 to 0.29, and DROP THE MIC was up 0.08 to 0.27. On Showtime, the season finale of BILLIONS was at 0.23, up 0.02 from last week but down 0.03 from the 2017 finale, with I’M DYING UP HERE ticked down to 0.03/179K, and THE FOURTH ESTATE was at 0.02/111K. Hallmark’s GOOD WITCH was steady at 0.22. FX’s POSE fell 0.05 from last week’s premiere to 0.19. On Starz, the season finale of SWEETBITTER gained 0.02 to 0.09, and the season finale of VIDA was at 0.06. Discovery’s NAKED & AFRAID led unscripted at 0.54/0.44, compared to last week’s 0.44. 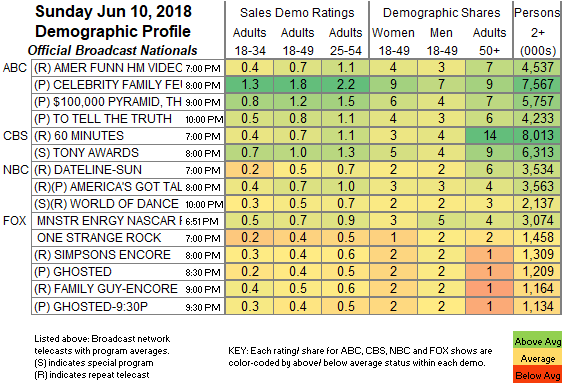 On TLC, 90 DAY FIANCE climbed 0.07 to 0.52, and LOST IN TRANSITION was up 0.03 to 0.22. ESPN’s MLB SUNDAY NIGHT game was at 0.51. 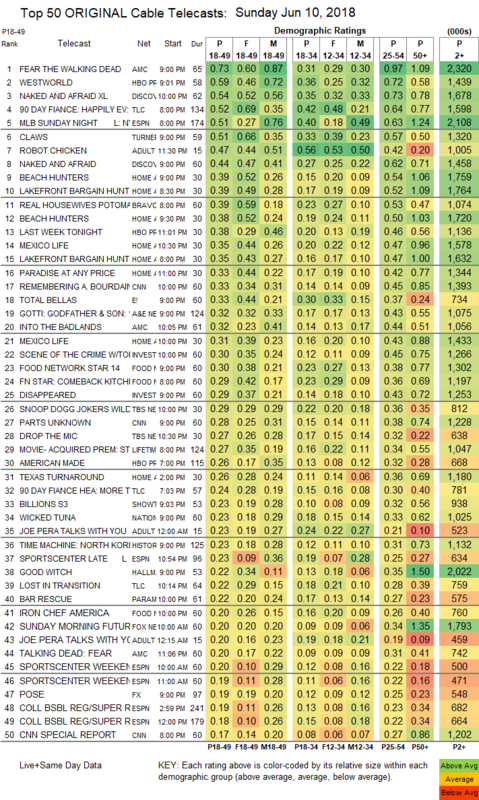 HGTV’s line-up was led by BEACH HUNTERS at 0.39/0.38, compared to last week’s 0.34/0.34. On Bravo, REAL HOUSEWIVES OF THE POTOMAC edged up 0.02 to 0.39, and YOUR HUSBAND IS CHEATING ON US premiered at 0.12. E!’s TOTAL BELLAS gained 0.04 to 0.33. A&E’s GOTTI: GODFATHER & SON was at 0.32. ID’s SCENE OF THE CRIME rose 0.07 to 0.30, and DISAPPEARED was up 0.04 to 0.29. On Food Network, FOOD NETWORK STAR dropped 0.07 to 0.30, and IRON CHEF AMERICA was down 0.05 to 0.20. Paramount’s BAR RESCUE slumped by 0.21 to 0.22.